Joe Hedges’ “hypercombines” lean into the dichotomy between traditional and new media by juxtaposing oil paintings on wood and canvas with technological components. 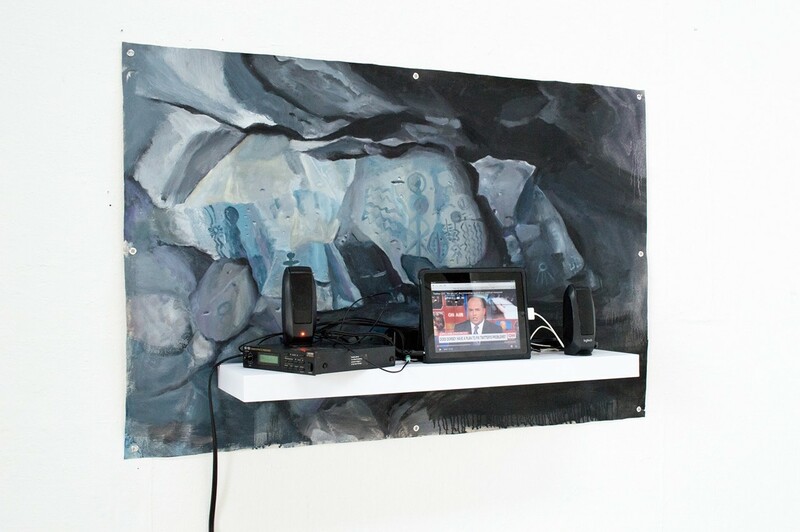 In Inscriptions, Hedges draws the viewer into a cave depicted in a wash of blues and grays, as the distorted echoes of contemporary broadcast news envelop them in an “echo chamber” of sorts. While Hedges’ paintings capture the natural world in intricate detail, the foregrounding of contemporary tech not only forces the viewer to “reflect on the screen-based experience of daily life in the 21st century,” but also calls attention to the artifice inherent in traditional media, for no matter how accurately rendered, each painting of natural scenery is still a facsimile — a snapshot divorced from its original context and displayed in a sterile exhibit for human consumption.